Travelled alongside the Tweed river this morning, took all the back roads until Alnwick. They were filming an episode of Downton Abbey at Alnwick Castle today, but only saw the horse and carriages. We had the Alnwick International Music Festival for entertainment as we ate our lunch. We watched an American hillbilly group doing some square dancing and then the bagpipes came on! It was market day as well so people everywhere. Stopped at Newcastle-upon-Tyne to take some photos of a section of Hadrian's Wall, which marked the edge of the Roman Empire and extended across the width of the country (80 miles), built around 120 AD. 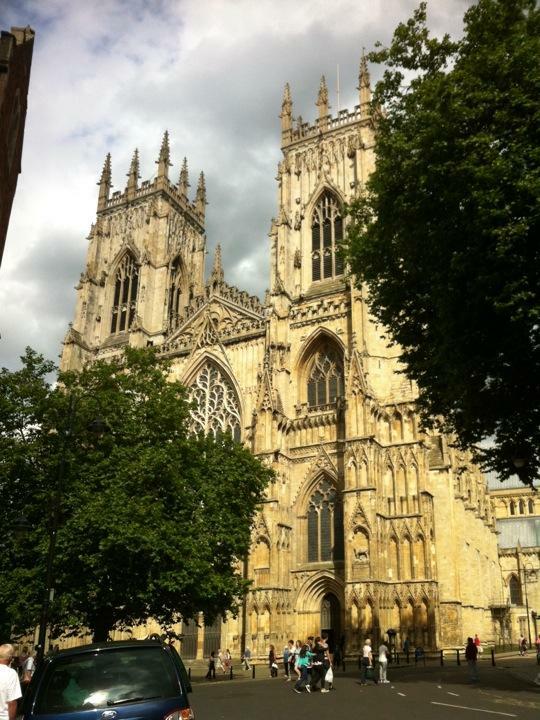 Continued on into county of North Yorkshire to York and walked from one side of the old city to the other. Saw the magnificent Yorkminster Cathedral (one of the biggest in Europe), where Guy Fawkes was born, the Shambles district and St Margaret Clitherow's shrine. Some very old buildings here. We had our farewell dinner tonight and stayed in the bar until midnight, drinking with Max (an 86 year-old gent on our tour who lives at Tannum Sands).